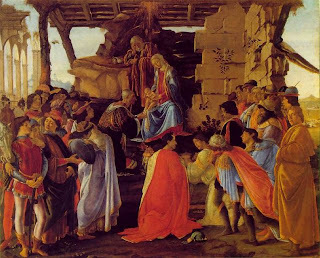 Botticelli was well known in his time, but was forgotten for centuries in the wake of painters like Leonardo, Michelangelo, and Raphael. He is now seen as one of the great Renaissance painters. This is a painting of the birth of Jesus. 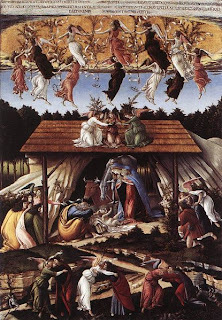 In it Botticelli shows not a peaceful manger scene that most Christians were used to, but an intense struggle between angels and demons for control of the world. This painting is of St. Augustine. The picture shows a conflict that was important in Renaissance times. Could information about God come from knowledge, or did it have to come from God? 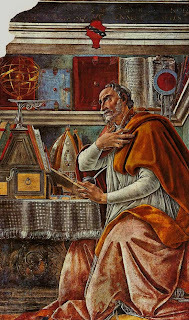 We see Augustine surrounded by things of earthly knowledge (books, scientific equipment), but he is looking up to heaven. This painting, is titled The Adoration of the Magi (Magi were the wise men who went to see Jesus after his birth). 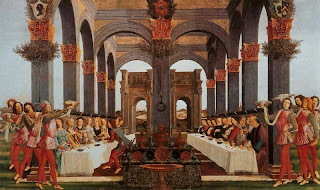 In this painting, Botticelli has added members of the Medici family, who sponsered many of his works. He has also included a self portrait, on the right looking out of the painting. Botticelli did not just paint Christian images. This painting of Venus and Mars shows amazing realism. The shadows on the face of Mars, as well as the expressions on the satyrs faces bring perspective. The imagery shows that while War (Mars) may have stopped or fallen asleep and been disarmed, Love (Venus) is still awake and alert. The image may be showing that "Love conquers All." This painting is of a wedding feast between two families. This picture is the last of four, the series of which is based on a story about wasting love. It was presented a married couple as a wedding gift. 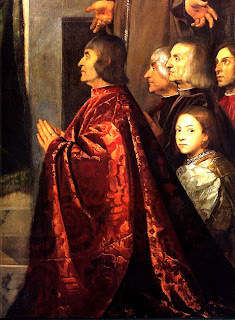 The Medici family was important in making sure that the two families were married. 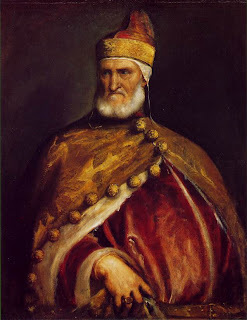 This painting of the Doge of Venice shows power and importance. The look on the portraits face as well as him grasping his robes with a forceful hand show strength. 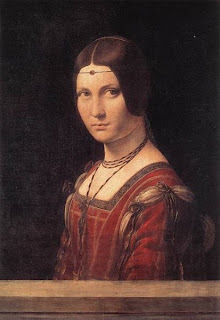 Titian is able to use his painting style to bring out the patterns and the texture of the fabric. 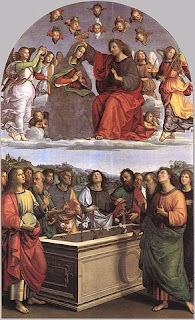 This painting, Madonna with saints and members of the Pesaro Family, was radical for its time. Unlike other artists, Titian refused to "even out" the picture, by painting the same number of people on each side. He also did not place Mary and Jesus in the center of the picture. He does use a battle flag to balance Mary, but still is asymmetrical in people placement. Along with Saints Peter and Francis, he also includes the Pesaro Family. Once again, the detail is amazing, and it is obvious that Titian's work with portraits helps him to capture emotion. Raphael is yet another artist from this period. He was a contemporary of Leonardo and Michelangelo. He utilized techniques from both of these men, and used it to create his own style. 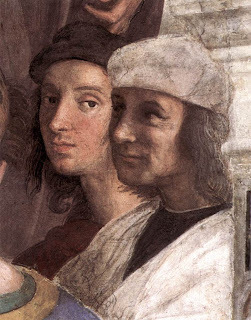 Raphael was known, like his contemporaries, for his realism. 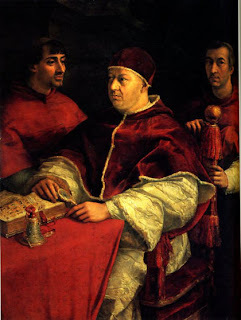 This painting of Pope Leo X shows details like wrinkles in the fabric. One imagines they can feel the textures of the robes. 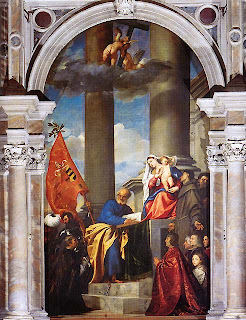 These details cause the focus of the viewer on the image of the Pope, while the bishops in the background are less distinctive. 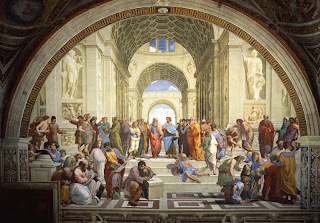 This work, called "The School of Athens" shows many of the great thinkers throughout history in various conversations. 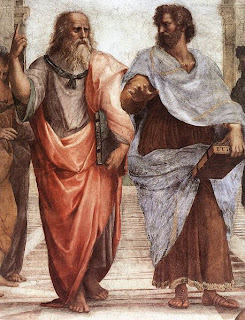 Throughout the painting are people like: Plato, Aristotle, Archimedes, and Pythagoras. He actually used his friends and other artists as the inspiration (for example, the face of Plato is really Leonardo). Raphael even added himself into the picture. It can be seen in this detail from the School of Athens. He is in the lower right hand corner of the painting, and is the only one looking at the viewer. 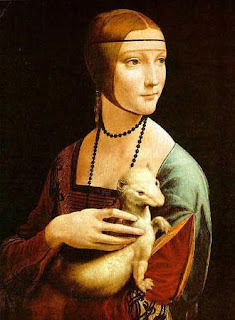 Leonardo is another of the famous Renaissance artists. He was known mostly for his inventions and other scientific advances, but he was also a gifted painter, as both this and the painting below show. The Renaissance is known for its realistic portrayal of humanity. 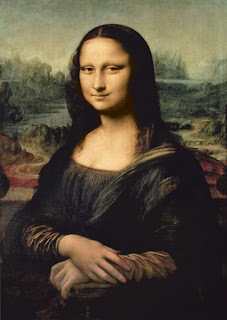 There are several paintings that Leonardo is known for, one of them is the Mona Lisa, a quintessential Renaissance portrait. There are people who see the smile as piece of artwork in itself, showing an amazing amount of depth, almost as though there is a story behind it. 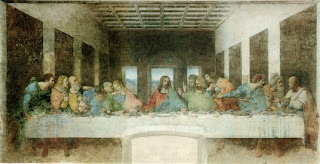 The other work da Vinci is associated with is this one, The Last Supper. It shows Jesus with his disciples before his death. It portrays the point at which Jesus tells his disciples that one of them will send him to his death. The painting is seen as a wonderful example of perspective, as everything in the picture points directly to the face of Jesus. This is a photo of the ceiling of the Sistine Chapel. 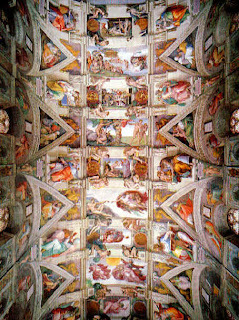 Michelangelo was one of many painters of this building, but was entrusted to paint the ceiling. It took him four years to paint this work, which is considered by some to be his greatest accomplishment. 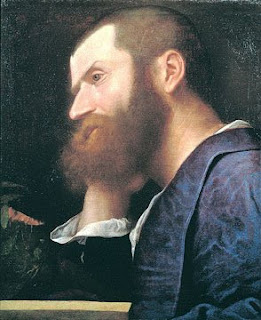 Afterwards, it is said that Michelangelo could only read things when held at arms length, above his head because of his time spent painting in this manner. 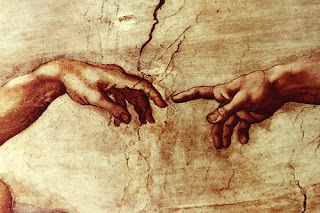 This detail of the most well-known of the scenes from the ceiling of the Sistine Chapel shows God's finger giving life to Adam. The detail in the hands is common to the Renaissance Period. The face of Adam is quite detailed as well, and shows Adam looking towards his creator. 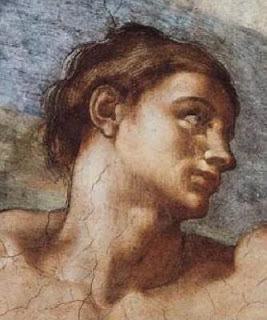 Michelangelo shows Adam as looking similar to God, and also with the peak form of an athlete. Michelangelo was also a gifted Sculptor. He started sculpting this statue of the biblical figure of David when he was 26 years old. This, is probably the most famous work of the artist whose first love was sculpture. 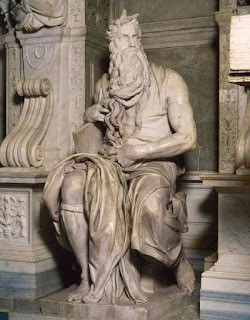 This statue of Moses again shows the detail common during the Renaissance. 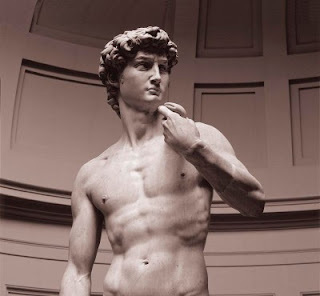 It was comissioned by Pope Julius II after seeing Michelangelo's work on the statue of David. The Sculptor is careful to show movement in the character, almost as though it were a real person frozen in time. The statue is a part of a larger tomb, which was actually started before the Pope asked Michelangelo to paint the ceiling of the Sistine Chapel.